I must say something in advance: I love Mark Gatiss’s episodes, so I can’t be partial here. 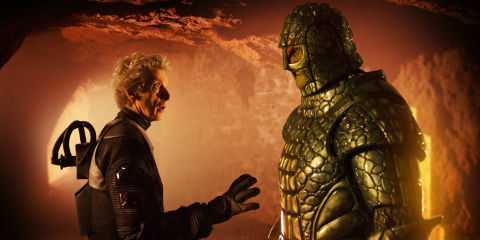 I know his scripts can be divisive, but I found ‘Empress of Mars’ to be true to the Doctor Who spirit and highly enjoyable. I’m not the only one to think this, am I? This episode was a great throwback at the Classic Who, with the return of the Ice Warriors, who had only showed up in the revived series back in the Smith era with the Cold War episode, and as usual, they did not disappoint. 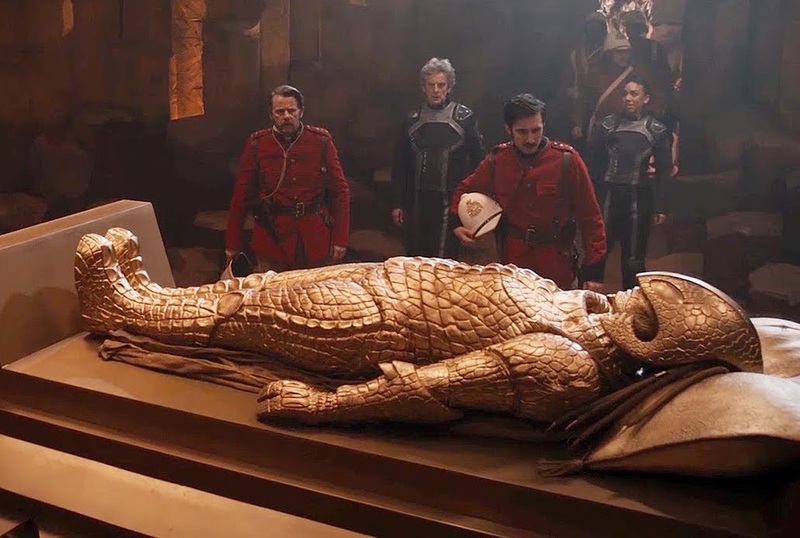 ‘Empress of Mars’ starts like an insane and improbable story, like all the best ones: the Doctor, Bill and Nardole sneak into the NASA headquarters for fun, and there they find that the North cap of Mars has a massive sign made with rocks that says “God Save the Queen.” What the hell is that? 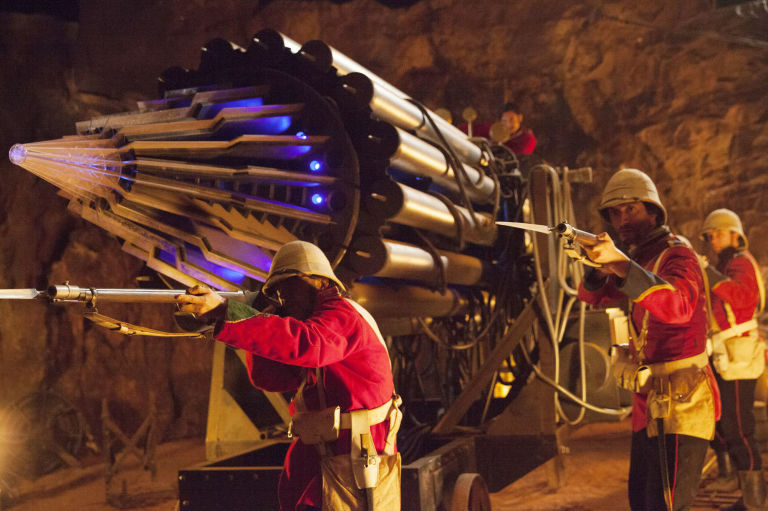 So of course, they decide to travel to Mars in 1881, the era where they find out the message was set up. What is happening on Mars? Well, some Victorian soldiers are living there mining the area because Captain Catchlove (nasty guy, this one) found an Ice Warrior, whom they call Friday, trapped in a spaceship, so they helped him in return to go back to his planet, where they could do all the mining. You know Friday is sort of lying, especially when the ‘tomb’ of the Ice Queen is revealed. As it happens, no one trusts anyone, the Victorian soldiers are way too quick to use their rifles, and it is up to the Doctor to save the day, not before the Ice Queen, Iraxxa, kills pretty much everyone and Catchlove goes hungry for power. This episode had many well-written storylines that gave us a deeper meaning to what it means to be an invader, and kicking out natives from their own home. Catchlove represented all that is wrong with these issues, whereas Colonel Godsacre, while a coward (his own words), is the true soldier, the one who is willing to die like one. It was a contained story, something we all needed after the three-parter, but if there is something to follow from this, is the dynamics of the relationship between the Doctor and Missy. We all know something terrible is coming this way. -I love the fact that the Queen’s portrait actually shows Pauline Collins, who played the monarch in the Tennant episode ‘Tooth and Claw‘ (‘Empress of Mars’ is set two years after the events in Scotland). -The Doctor hasn’t seen Terminator, The Vikings or The Thing, but he’s seen Frozen. Someone please help him work out his priorities. -The Doctor’s reaction upon seeing Missy in the TARDIS became more poignant because of a conversation he’d had with Bill earlier: “You knew that would happen.” “Always been my problem.” “What?” “Thinking like a warrior.” Is he predicting a war? -I loved the confusion when a soldier finds the Doctor with Friday, and the Doctor thinks he’s referring to Friday when talking about a monster but is in fact talking about the Doctor. -Why did everyone had hilarious surnames? That’s why you have to love Gatiss. -Friday’s face when Bill holds his hand was priceless. -Oh my, Alpha Centauri was voiced, decades later, by Ysanne Churchman, who is 92 and awesome.